With a metal tool like the one a dentist might wield, Dave Malone reaches into a small glass beaker and plucks out a tiny scoop of what looks like pine sap. The substance glows under the fluorescent office light, and with a practiced hand, he deposits it into a battery-powered heating cup mounted on a small bonglike smoking device. He passes me the rig, loaded with Passion Z, the daughter of his custom strains Kustom OG and Hindu Zkittlez. After breathing in, I let the vapor sit in my mouth, as instructed, before inhaling softly, and sure enough, I pick out mango, kiwi, and papaya on my tongue. It’s spring break in a puff, and it lifts my spirit with equal parts THC and California dreams. Weed enthusiasts have long rhapsodized about strains of indica or the crystalline sugars attached to plant flowers. But with concentrates, Malone and others like him are hoping to unlock a new marijuana market, one devoted to the plant’s flavors, as if it were a rare whiskey. It’s a huge shift, because when Colorado legalized recreational weed in 2012, concentrates were basically low-quality by-products, a way to wring every intoxicating drop of THC (the compound of weed that gets you high) from dry stems and inferior plant parts. They were the weed equivalent of wine made from third-press grapes. But Malone saw the potential for a first-press market, so in 2014, he founded Green Dot Labs with his wife, Alana, and began cultivating marijuana specifically for whole-plant extraction—the first company to do so. To demystify the extraction process, Dave leads me through a security door next to a wall-mounted iPad the company uses to track guests. Inside, we find two steampunk-style extraction machines walled off behind glass and positioned under a vacuum-hood ceiling. This is where the magic happens. A lab tech fills a stainless-steel column with chopped flowers and trimmings, and then he throws open a series of valves. Liquid butane, chilled to roughly -60 degrees flows through the plants, binds with the essential oils, and carries the oils to a metal chamber that converts the butane to vapor by slightly increasing the temperature. That frees the oils, which settle to the bottom as a slurry of psychoactive and medicinal goodies (cannabinoids, terpenes, and flavonoids) that flow like honey from the extraction machine. The lab carefully collects that warm goo in a jar. The process of preserving flavor is more chemistry than farming, but ideally the result is similar to what you find in a fine wine: a product that tastes like where it came from. 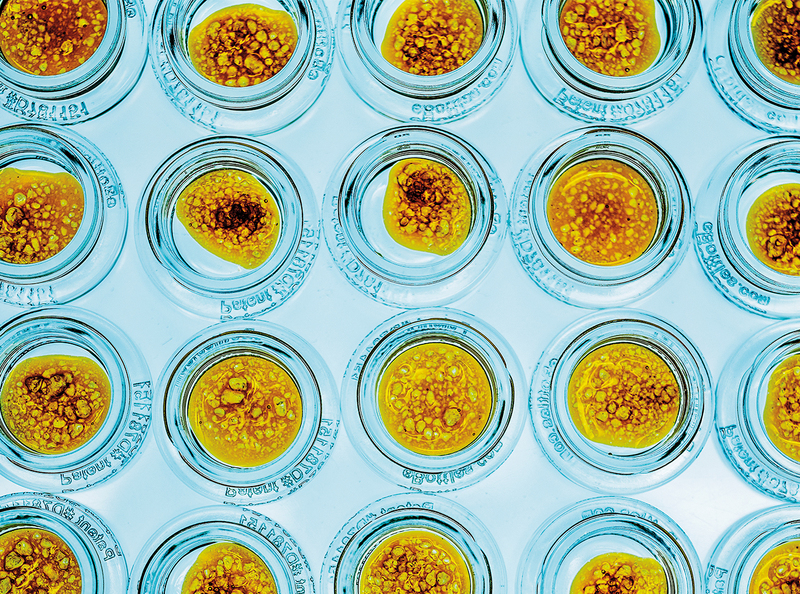 And in this still-new world of legal weed, where dispensary shelves are heavy with edibles, tinctures, and sublinguals, it is concentrates that seem uniquely poised to appeal to a high-end market. 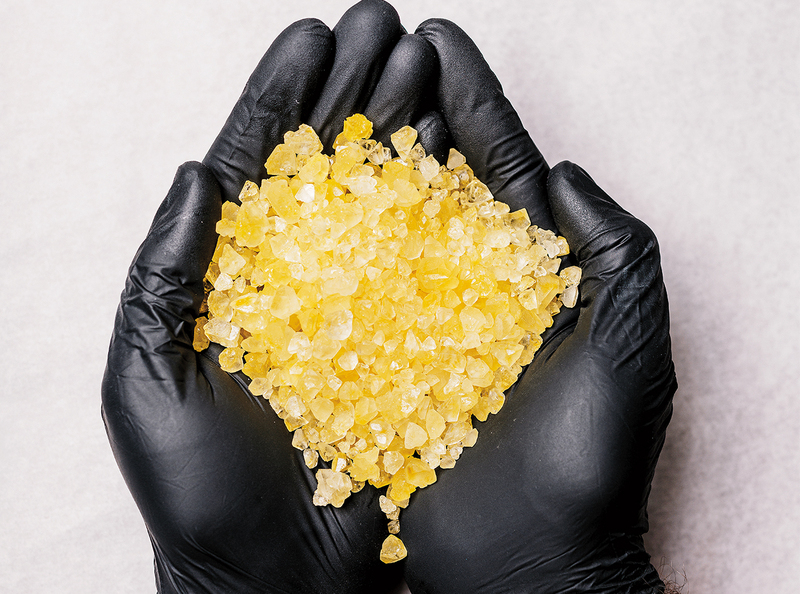 Concentrates create a “cleaner” high, according to experts, because the oils are converted to vapor at a much lower temperature (350 degrees versus the 3,000 degrees of most bongs, for example). More importantly, high temperatures can destroy some of pot’s delicate terpenes, which make weed taste fruity, sweet, piney, musky, and so on. So low-temp vaporization, the argument goes, actually brings users closer to the flavor of the plant. And those who care about that distinction will pay multitudes more for the premium experience: Concentrates are roughly seven times more expensive than buds for rolling joints. Concentrates sell under names like wax, shatter, and oil, and are usually consumed one of two ways: through a tabletop vaporizer (sometimes called a dab rig) or with a vape pen. Collectively, these products now account for nearly a third of pot revenues. In the nine states where recreational weed is legal, they brought in $1.57 billion in sales last year. There is plenty of competition in the market: Craft 710 and Guild Extracts, for example, also create live-resin extracts—meaning that the plants are processed either fresh or fresh-frozen—and San Francisco’s Bloom Farms released a single-origin vape pen before Green Dot. But no one is quite as committed to perfection as Green Dot Labs. Its vape pen, for example, uses the company’s butane-extracted oil, whereas Bloom Farms’ is made with CO2-extracted oil, which results in less flavor, according to Kind Love’s Labrier. (The concentrate cognoscenti have strong opinions about the various extraction methods.) Green Dot is also a leader in the cultivation of plants. 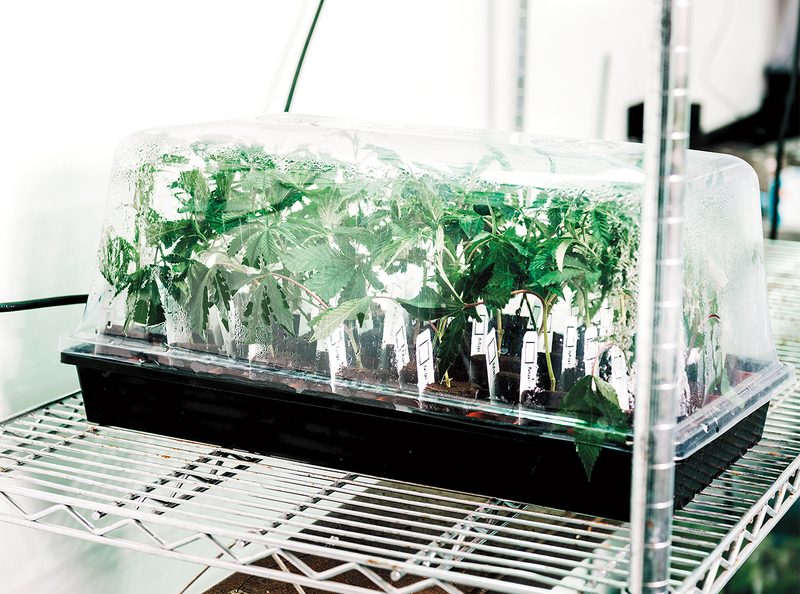 Malone sells extracts and oil cartridges from about 150 plants, but, through breeding, he hopes to have thousands of strains worthy of processing one day. Walking through Green Dot’s grow room, I see flowers flush with psychedelic purple and red. I touch one with a gloved hand and pull back to see my fingertips glistening with resin. THE FIRST TIME Malone encountered cannabis concentrate was at a String Cheese Incident concert in 2007. He’d grown up smoking weed in his parents’ house in Louisiana and even grew pot in his apartment in college, before he moved to Boulder. But concentrates were different. The high was familiar, but it was lighter and more energizing. He got so stoned that he left his own hash behind. 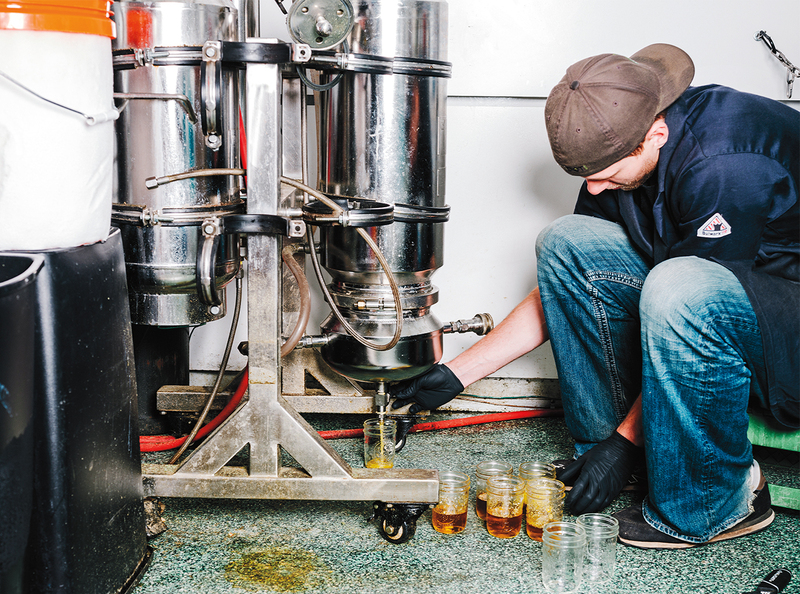 Through online forums like Overgrow and ICMag, Malone began researching resin extraction. He discovered that amateur chemists were blowing themselves up while experimenting with the hydrocarbon gases required to pull oils away from plants. But he proceeded with caution, and the science came to him quickly. Soon enough, he was dabbing his own supply and honing his production process. The year he discovered concentrates was also the year he met Alana, a New Jersey transplant. For their first date, he drove her to Coal Creek Canyon to visit an indoor garden where he’d been consulting. The two bonded while trimming pot plants, and as soon as Colorado voted to legalize recreational weed in 2012, they decided to launch a cannabis company. Alana’s parents came on as investors, and the Malones spent 22 months building a 2,500-square-foot grow room and pharmaceutical-grade extraction lab at a cost of half a million dollars. But the work paid off. Within weeks of distribution, Green Dot’s Black Label Fine Cannabis Extract, the company’s flagship product, sold out. Within two months, the Malones were turning a profit. As planned, they essentially owned the market for high-end extracts. Green Dot has pushed innovation on other fronts, too. Last year, it released a first-of-its-kind vape pen that relies on single-origin oil cartridges, each one derived from a clearly labeled strain of marijuana, produced with hydrocarbon extraction, and free from chemical cutting agents that can wreck the flavor in lesser pens. The pen was $60, more than twice as much as some competing options, but it found a home with dedicated aficionados. Late last year, Green Dot opened its second Boulder grow-room and extraction-lab complex. At 10,000 square feet, the new facility has five grow rooms, each of which can handle 210 plants, and enough extraction space to pump out 2.5 pounds of cannabis oil every hour of every day. Last October, when the Malones moved into their new facility, they had a staff of just 12 people. Now they have a staff of 50 and are projecting $10 million in revenue this year. The company is gearing up for series B funding, after which is hopes to launch a still-secret vape pen built on a new innovative hardware. “I can’t reveal much about it yet,” Malone says. In preparation for the demand spike that will likely occur as more states legalize weed, they’re working toward opening new growing and processing facilities in Colombia and Canada. One day soon, marijuana users might take for granted that concentrates are the best way to achieve a buzz. And with the race to make the best product already underway, Green Dot is doing everything it can to maintain its lead. “It’s humbling to think how far this plant has taken me and my family,” Malone says. Then, after a pause: “And it’s more amazing to imagine where it’s going to go from here.